This document provides general characteristics for fresh baker’s yeast: block or compressed yeast, granulated yeast and liquid yeast. Although – or maybe just because – fresh baker’s yeast is a very long standing natural product, no real definition of fresh baker’s yeast exists at the moment. Also in the Codex Alimentarius a description of fresh baker’s yeast lacks. The yeast mentioned in the Food Chemical Codex is inactivated yeast and the description is not relevant for fresh baker’s yeast. In order to establish a description for fresh baker’s yeast, the technical committee of COFALEC prepared this document. This document provides general characteristics for DRY baker’s yeast. It has been drafted by the technical committee of COFALEC. The General characteristics of yeast have been approved, in English, by the General Assembly of COFALEC. In order to make them available in other languages, the National Yeast Association made a translation in their language (he official version remains the English one). Bread came into being from observations made by the Egyptians 3,000 years ago of the transformation of the dough by beer froth which they scooped up from the surface of bowls. Since then, the history of bread, yeast and men is tightly linked. For a long time, bread was a basic food element in Europe and in the whole Mediterranean basin, with a high symbolic content. Without fermentation by yeast, a living and natural product, we could not obtain the equivalent of bread or Viennese pastry. Bread is less important nowadays as a basic food in developed countries, but it is still a healthy product, harmoniously helping to bring about a balanced diet and nutritionists recommend its consumption. In the process of fermentation, yeast produces carbon dioxide, alcohol and other compounds which enable dough to rise and modify its physical properties. When the fermentation is correctly achieved, depending on the quality of flour among other things, the baker will obtain the proper external and internal characteristics (grain and texture) suitable for a determined finished product. Together with alcohol, a small amount of other volatile compounds are released. These are involved in the original taste and flavours of baked leavened products. Most of these compounds, and all of the alcohol, evaporate when baked. There are two stages during the fermentation of a dough made from flour, water, salt and yeast, and with no extra sugar added. First of all, yeast ferments sugars naturally present in flour, which can be directly and easily assimilated. These sugars represent about 1.5% of the flour weight. At the end of this first stage, gaseous releases more or less slow down. The second stage corresponds to the fermentation of a sugar contained in flour called maltose. Maltose comes from the action of some enzymes, the amylases, on the starch granules of the flour, damaged during the milling process. Amylases which are naturally present in flour, split starch into small fractions of a much simpler sugar, the maltose. The action of amylases starts as soon as water is added to the flour and stops during baking. The action of the flour amylases is completed by that of another enzyme of yeast, the maltase which, in its turn, splits maltose to give the most simple sugar, glucose. The glucose is transformed by the yeast into carbon dioxide and alcohol. Maltose formed from starch must be present in sufficient quantity so that the production of carbon dioxide makes dough rise correctly until it is put in the oven. Since 1960, the bakery industry has benefited from better adapted yeast strains, allowing a rapid process as they ferment the maltose sugar earlier. Effectively, the maltose is fermented only when there are no or little pre-existing sugars or added simple sugars left in the dough. The yeast industry has studied to a great extent baker’s yeast strains, not only with a view to making them more rapid, but also to adapt them as much as possible to different types of baking processes. If sucrose has been incorporated into the dough, it is immediately transformed by a yeast enzyme, the invertase, into glucose and fructose (the two basic links composing sucrose are thus separated). When sucrose or glucose are added to the dough, they are directly fermented before maltose. This means that in such a dough, mainly sucrose or glucose are consumed by the yeast. These sugars do not contribute to giving the bread a sweet taste since they are partly consumed. 2 and 5 kilos of compressed yeast for 100 kilos of flour. In practice, this proportion varies effectively according to the baking process and the temperature of the bakery. 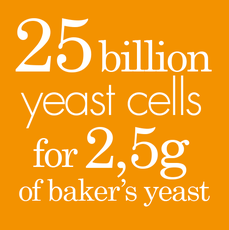 25 billion yeast cells. This is the proof that baker’s yeast is predominant in the bakery fermentation. Fermentation begins as soon as the yeast is in contact with the mixture of water and flour. During the first fermentation (bulk fermentation), the baker lets the dough rise for a first time. 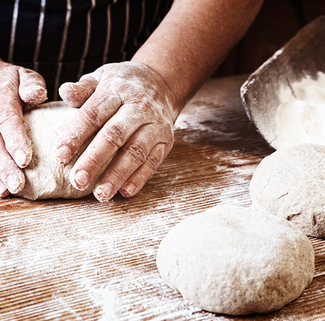 During that stage, the physical properties of the dough (extensibility and elasticity) are modified, thus completing the kneading action. This is an important stage on which depends the final quality of the bread: external and internal characteristics, taste and aroma. The mechanisation of the division of the dough requires some rest so that the dough pieces may relax before moulding, in order to recover some extensibility. The fermentation process goes on in the cut lumps of dough during the proofing which can be made on layers, on flexible nets or in moulds, in cupboards at ambient temperature or in proofing ovens. In order to prevent the lumps of dough drying out during this stage, they must be covered so as not to hinder the development and the appearance of the finished product. This stage can be achieved by a cold-controlled fermentation, in chambers in which temperature and degree of humidity (hygrometric degree) are determined with precision. Thus, the fermentation can be controlled and working hours organised. In the case of French bread, the baker makes small and regular blade incisions in the lumps of dough just before putting them in the oven. These incisions will give nice edges, the puckering, on the crust of the bread. It is a delicate operation requiring much experience: it is said that it is the baker’s signature because it essentially depends on his know-how. Without these blade incisions, the loaf of bread loses its shape and bursts under the violent release of the carbon dioxide and steam which appear right after being put into the oven. The blade incision is therefore not made for decorative reasons only, but it also gives the loaf a regular aspect by creating a zone where the dough will be torn in the right direction. Thus, the loaf gets a regular volume and an optimal development. the first one, only for biscuits and cakes, is the use of a chemical powder which makes dough expand as soon as it is put into the oven; the second one, for bread and Viennese pastry, is the use of natural living yeast which requires fermentation before it is put into the oven in order for the dough to develop. The use of chemical powder may seem more simple and convenient, but its use is not appropriate for bread making. On the one hand, carbon dioxide is not produced in sufficient quantity to obtain a light and alveolated bread texture and, on the other hand, only a fermentation agent like yeast can give bread its organoleptic quality. Bread is symbolical food which, in spite of its various compositions, is appreciated worldwide thanks to a special manufacturing process: fermentation. 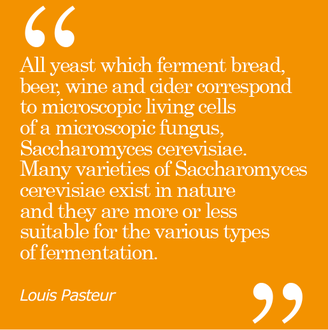 Between 1857 and 1863 Louis Pasteur demonstrated the role of yeast as a micro-organism responsible for fermentation. such as beer, cider, spirits and wine. Chaptal and Pasteur made a direct contribution to the noble qualities that are today undisputed in winemaking and oenology, by revolutionizing wine hygiene. The discovery of microorganisms and in particular the exact nature of alcoholic fermentation (a key stage in winemaking) and the role of yeast that transforms sugar into alcohol have given winemakers the means they require to put an end to incertitude, and to help overcome nature’s inadequacies. Without yeast there is no wine! They ensure grape fermentation: the fundamental stage of vinification that transforms the sugar from the grapes into alcohol. the sugar from the grapes into alcohol. What is the role of yeast in wine making? the grapes into alcohol, and are naturally present on grapes. a multitude of other microorganisms. Once the role of yeasts was discovered, oenologists immediately began to select the most suitable yeasts for revealing the aromas present in the grapes, and to prevent the action of other yeasts that could impede vinification or have a detrimental effect on the wine. Following on from Pasteur, oenologists have developped tools that have improved knowledge concerning beneficial yeast strains present on the grape and enable them to be isolated. As for detrimental strains, such as Brettanomyces, also known as «contamination yeasts», the oenologist now has the capacity to block them. The function of revealing varietal aromas is essential in yeast. It releases enzymes into the fermenting wine that render aromatic conpounds that were blocked by the grape molecules valotile - and thus odorous. the yeasts most able to ensure this revelation of aromas present in the grape varieties and conditionned by the terroir effect. Sauvignon is known to be a particularly aromatic grape variety. It is present extensively in French, American, South African, Australian and New Zaeland vineyards. Today, the majority of wines throughout the world are vinified with yeasts selected by oenologists. It should also be noted that the use of oenological products in vinification, and more particularly yeasts and bacteria, has allowed wines to maintain a certain degree of substainability in trems of taste across different vintages. Oenology taday has been able to identify a multitude of yeasts in order to respond to the diversity of local lands and to ensure better control of this tool. For that matter, it should be noted that yeast can produce so called «fermentative» aromas in variable quantities depending on the strains and particular fermentation conditions. These aromas, identified with amyl notes of certain types of wines (“fruit drop” or “banana” for example) can be sought after or on the contrary, avoided. This choice can be guided thanks to the natural diversity of yeast strains. Increasingly detailed knowledge of the role played by yeasts and bacteria in vinification constitutes a fundamental line of work as the oenologist is now in a position to use them to contribute towards wine hygiene and to reduce sulphite* addition. *Sulphites play a key role in the control of fermentation and storage of wine in limiting the development of undesirable microorganisms. Oenology, a savoir-faire dedicated to wine, powered by Oenoppia (Oenological Products and Practices International Association). There are two main types of brewer’s yeast: the bottom-fermenting yeast, Saccharomyces uvarum (lager fermentation) and the top-fermenting yeast, Saccharomyces cerevisiae (ale fermentation). Their action is identical: they absorb the sugars present in the fermentation tank (melibiose for lager fermentation, fructose for ale fermentation) to turn them into alcohol. Their first difference appears in the following step of the process. After fermentation, yeasts will either settle down to the bottom of the tank (bottom fermentation) or up to the surface (top fermentation). On the other hand, these two types of yeast are evolving in different environments: lager fermentation yeasts are active at temperatures lower than usual (7-15 ° C) while ale fermentation yeasts cannot grow at temperatures below 15-20 ° C.
Their last difference remains in their gustative characteristics. Lager fermentation beers have a lower rate in alcohol but a higher one in CO2. Therefore, they develop an aroma with overtones of sulphur and they are recognizable by their more pronounced hop taste. 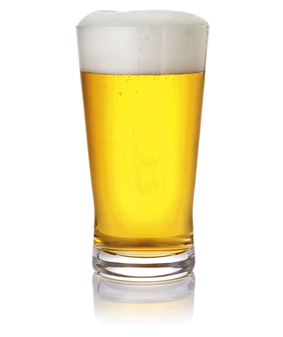 Ale fermentation beers have a higher rate in alcohol and have more fruity, estery and malty aromas. Probiotics are live microbial feed supplements which beneficially affect the host by improving its intestinal microbial balance. Yeasts as probiotics are feed additives for stabilising the microbial communities of the digestive tract in monogastric animals and ruminants and regulate the ruminal pH and limit acidosis risks. The most common yeast species used in the feed industry is Saccharomyces cerevisiae. Some of these strains optimize the growth potential of monogastric animal. Until 1825 when compressed yeast was introduced by Tebbenhof, yeast was sold in liquid form. The return to this form is a response to requests from industrial bakers. This is the most widely used form in industrialized countries for economic and practical reasons. It comes in compact blocks which reduce contact with oxygen in the air. Its colour and crumbliness differ from one country to the other. The packaging of "wax paper" or "sulphide paper and cellophane" reduces gas transfer and controls moisture migration, to provide extended shelf life. This comes in relatively fine and free flowing particles; it can thus be weighed or metered automatically. It is packed in multilayered paper bags which are polyethylene lined and sealed to prevent access of air. Crumbled yeast is often dispersed into water by industrial bakers, which makes automatic dosage possible. This yeast is dried in granular form or small beads. It is packed in tins, plastic bags or drums or sachets under vacuum. It is also available for domestic use in sachets of 5 to 11 g. It can be stored at ambient temperature. The product hardiness gives a good level of stability making it popular in parts of the world where climatic conditions are less than ideal (high temperature and humidity). This type of yeast has to be rehydrated in lukewarm water before use. The fine particles of instant dry yeast are vacuum-packed in sachets. It also exists in sachets of 10 g under protective atmosphere for domestic use. This type of yeast can therefore be stored at ambient temperature. The instant dry yeast owes its name to the fact that it does not require prior rehydration before being added to flour. It may be used just as easily as compressed yeast. In granular form, packed in tins, this yeast is designed for pizza makers. Its moderate, regular gassing power provides the fermentation tolerance required for this type of application. Its reducing power makes it easy to shape the pizza thus avoiding the shrinkage effect. the membranes (rendered completely permeable) allow the leakage of the whole cell content to pass through. 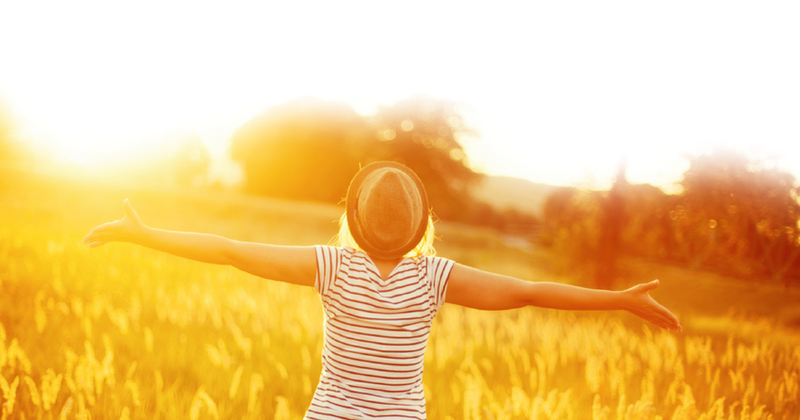 One of its components, glutathione, has a reducing effect on the gluten. improving the machinability of stiff doughs or those which have reached a high level of maturation; accelerating the dough development during mixing which requires a decrease in mixing time by 15 to 20%. This characteristic reduces dough oxidation during mixing, therefore preserving the ferment flavour which gives aromatic quality to the finished product.